Fukuoka began his career as a scientist based in Yokohama working for the Japanese government. He researched ways of combatting diseases in valuable agricultural crops. He was happy and successful. Then, while still a young man, he was hospitalized with pneumonia. During his recovery, he had a spiritual awakening, which led him to question everything he had previously been taught. He scoured the countryside in search of traditional farms, asking about farming methods before the arrival of modern chemicals and large machinery. Could it be that the technology used in industrial farming was creating more problems than it solved? Were the designers of ever-more powerful fertilizers, pesticides and genetically-modified crops moving in the wrong direction? Was there an alternative path that would not be so disruptive of native eco-systems? Fukuoka resigned his government position to become a farmer, moving back to his father’s farm on the southern island of Shikoku to take care of a hillside orchard. Here Fukuoka applied traditional non-invasive approaches to growing fruit and rice. News of his unusual methods spread and visitors began arriving at his farm, many of whom became volunteer workers. Teaching these young recruits led Fukuoka to jot down his ideas. 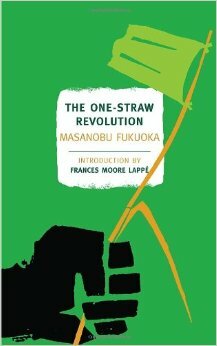 The resulting book, One Straw Revolution, published in 1975, was an astonishing statement of a creed of simplicity and adherence to natural ways. Here is a sampling from the book. I start with Fukuoka’s contrast of his own traditional farm with that of a modernized neighbouring farm. “Make your way carefully through these fields. Dragonflies and moths fly up in a flurry. Honeybees buzz from blossom to blossom. Part the leaves and you will see insects, spiders, frogs, lizards, and many other small animals bustling about in the cool shade. Moles and earthworms burrow beneath the surface. This is a balanced rice field ecosystem. Insect and plant communities maintain a stable relationship here. It is not uncommon for a plant disease to sweep through the area, leaving the crops in these fields unaffected. In the middle of his book, Fukuoka discusses the need for rethinking long-standing harmful practices. He points out that once a practice becomes habitual, no matter how ineffective it proves, people have trouble changing course because their minds have grasped hold of a fixed idea that seems all but unshakable. 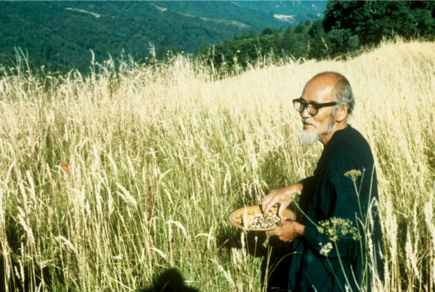 In the final section to his book, Fukuoka turns his attention to the subject of food. He argues that people’s diets are unhealthy because they are based on ill-conceived notions of what is and isn’t tasty. The prejudice against simple natural foods is an acquired cultural absurdity. Even by the standards of most conscientious organic farmers, Fukuoka’s methods often appear radical. Critics view his ideas as impractical or unsuited for Western climates and conditions. Fukuoka counters that his methods are not quick easy fixes. Patience and experimentation are required. What Fukuoka has achieved is help spark a debate about food and land use, a debate which gains in relevance as concerns mount over the health risks of GMOs, pesticides and land depletion. Fukuoka is now regarded as a pioneer of the permaculture movement. His vision of farming as a seeking of balance in a larger ecosystem offers a healthy alternative to the destructive practices that are currently employed.